Stop in and get a 50-50 Muffler T-Shirt for only $20! 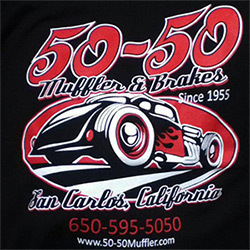 For over 50 years, 50-50 Muffler & Brakes has been the premier muffler shop in the San Francisco Bay area. If you’re in need of repairs, services or sales of mufflers, brakes and other car parts, come into 50-50 Muffler & Brakes today. Since 1955, 50-50 Muffler & Brakes has been the San Francisco Bay area’s top source for quality muffler and brake repairs, services and sales. We take pride in offering our customers the highest level of customer service and quality of work, and we enjoy being many people’s go-to source for brake repair in San Carlos, CA. With almost six decades of experience under our belts, we’ve seen it all. That means that regardless of what your brake or muffler needs may be, we have the knowledge and skill necessary to handle the job. We are your source for quality automotive services, including suspension repair in San Carlos, CA. We specialize in muffler repair, brake repair and suspension work on all vehicles. We have been a proud, local, family-owned business since 1955, and will treat you like a neighbor and friend. We also offer service on lift kits and lowering kits in San Carlos, CA. We are a competitively priced muffler shop in San Carlos, CA.